Every year on the anniversary of Roe v. Wade, the day that the Supreme Court decriminalized abortion in the United States in 1973, hundreds of thousands of dedicated pro-lifers gather in Washington, D.C. to stand in solidarity with the babies who have lost their lives through abortion. January is an important time to reflect on how we can continue to end abortion—both during and after the March for Life. Every year, over one million babies are slaughtered through abortion, and almost 60 million babies have died since 1973 in the United States. Those facts alone should be enough to urge every pro-life person in the United States to work tirelessly to end abortion. 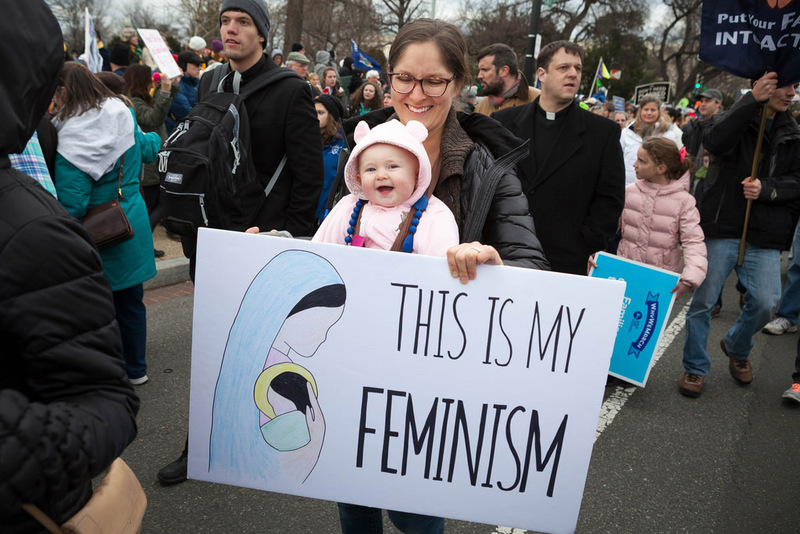 The spirit of solidarity that we share with the preborn babies as members of the same human family should encourage us to stand up against abortion in our own communities, schools, and families every day of the year, not just on January 22 in Washington, DC. One day each year we protest, we gather with other pro-lifers, and then we go home, often forgetting that millions of mothers and fathers are hurting every day in our own communities from the horror of abortion. The speeches we hear, the signs we carry, and the conversations we have on January 22 should inspire us to take the pro-life message into our own communities. Every abortion hurts our entire society. Women who have had abortions not only suffer from physical consequences, but emotional and psychological problems as well. With every abortion, a person is denied the chance to enter society and make the world a better place. As pro-lifers, we must make a conscious and deliberate effort to help those around us who have been hurt by abortion. We need to work harder to ensure that pregnant women who are facing difficult situations do not think of abortion as their first and only option. When human beings are not respected at their earliest stages, how can we expect society to respect people with disabilities or those near the end of their lives? With the decriminalization of abortion, other threats have become increasingly salient in our society, particularly in the right-to-die movement. Euthanasia is quickly becoming the next urgent pro-life issue. As states begin to recognize death and suicide as rights or as replacements for compassionate care, it is important for us to be aware of the threats to human beings in our own communities. We need to educate ourselves on these issues—not only so that we can be strong witnesses of the gospel of life, but also so that we can proactively combat the culture of death in both public and private settings. Every human person deserves respect. The past few years, pro-life heroes like David Daleiden and the Center for Medical Progress showed the world the truth about abortion and the harvesting of baby body parts for profit. Not everyone is called to conduct undercover investigations like Lila Rose or David Daleiden, but we each have a mission to stand up in defense of every human person, no matter how small. We are each blessed by God with special talents and abilities. Ask yourself: How can I use my special talents in the Lord’s service? How can I help end abortion? We need heroic homeschool parents, teachers, students, business people, janitors, and doctors. No matter where you are or what you do in life, there is a way for you to share the gospel of life with those around you in unique and creative ways. This January, and this new year, let the March transform your efforts to end abortion. Everyone can make a difference in ending abortion. Become educated, understand what is at stake, and pray for courage to carry out our mission. We can end the culture of death if we work together. This article has been reprinted with permission and can be found at cultureoflifestudies.com/blog/what-every-pro-lifer-should-know-about-january.